“Water station”, which is Bertrand Lamarche’s latest work, articulates the main topic of the exhibition that is to set artistic fictions into a common and established reality. The artist used to trap our benchmarks, to distort our perceptions by creating illusionary devices. 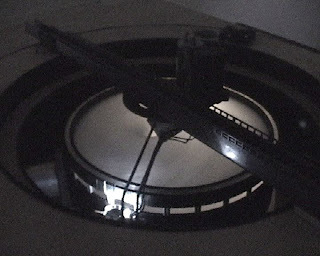 Here, a careful and intelligent mechanism miniaturizes a kind of “magic lantern process” coupled with a «motion-control camera» effect, which creates and displays in a darkroom an image that depicts a kind of «primordial soup», a milky whirlwind which seems to be captured by the camera in real time in the depths of the lake. As astonishing as threatening, the representation modifies our perception of the placid lake that surrounds the art center. The origin of this image is not hidden from the spectator, although it could have, he wanted one to follow this whirl of meaning. 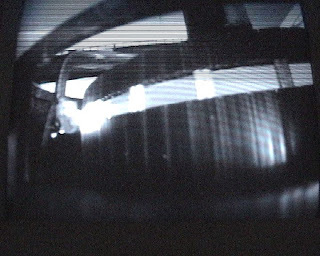 But even the knowledge of the device’s operation, built from ordinary materials, doesn’t even manage to decrease the fascination operating by watching this ghostly image. 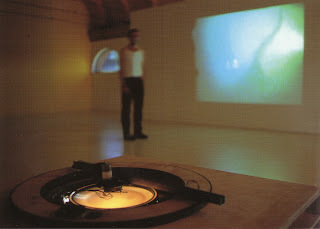 Lamarche increases the emulation of a permanent work of imagination that could act onto the most daily objects.